UNIS is a pre-kindergarten-to-twelfth grade, coeducational, college-preparatory day school which offers a unique combination of academic and cultural education found in no other school in the world. UNIS encourages high achievement and the enjoyment of learning, and celebrates the differences and similarities of its students who represent about 125 countries. The Manhattan campus enrolls children in Pre-Kindergarten through twelfth grade. UNIS Queens enrolls children in kindergarten through eighth grade; at the ninth grade level UNIS Queens students may automatically transfer to the Manhattan Campus. UNIS Manhattan is located on a site overlooking the East River, one mile south of the United Nations. The Queens campus is in suburban Jamaica Estates. The Manhattan campus enrolls children in prekindergarten through twelfth grade. UNIS Queens has rolling admissions throughout the year for children in kindergarten through eighth grade; at the ninth grade level, UNIS Queens students may automatically transfer to the Manhattan Campus. UNIS refers to student grades by division: Junior School, prekindergarten to Grade 4 (PK-J4); Middle School, grades five to eight (M1-M4); Tutorial House, grades nine to twelve (T1-T4). The United Nations International School provides an international education that emphasizes academic excellence within a caring community. The School promotes the appreciation of the diversity of persons and cultures, provides an optimal environment for learning and teaching, and offers a global curriculum that inspires in its students the spirit and ideals of the United Nations Charter. Provided that space is available in the relevant grades, we welcome applications for prekindergarten through twelfth grade from families of the United Nations as well as those from the international and greater New York communities. In accordance with our mission, children whose parents transfer from abroad to work for the United Nations, Missions to the UN, and Consulates enjoy priority in terms of admission, but admission is not automatic. All children are required to be interviewed and assessed in person at UNIS so that we can determine whether our program is the right fit for them. An online interview can be arranged for applicants for fifth grade and above who reside abroad (to make arrangements, please email admissions@unis.org). We can give an admission decision only after we have assessed the child and have also received all the necessary documentation, which we should receive prior to meeting with the student. UNIS seeks students who can benefit from a challenging education with a global perspective and who will contribute to the UNIS community. The School offers the International Baccalaureate (I.B.) Diploma Program, a two-year rigorous program that begins in the eleventh grade. It requires a high level of achievement in all academic subjects. Space permitting, qualified students are admitted at all grade levels through eleventh grade. Ordinarily, applicants are not admitted to the twelfth grade unless they have completed the first year of the I.B. Diploma Program. Applicants to PK (preschool) must be four years old by 31 December in the year they enter that grade. In addition, those applicants to JA (kindergarten) must be five years old by 31 December in the year they enter that grade. Older students normally move on to the next grade. Some UNIS applicants come from countries that begin the school year in months other than September, and those families should please contact the Admissions Department to discuss which grade their children should apply for. Students applying to the tenth through twelfth grades (T2 to T4) should verify, prior to applying for admission, that they can meet graduation requirements by the end of twelfth grade. ELL For those students who are not proficient in English, English Language Learners (ELL) classes are available. For grades 11 and 12, however, students must be proficient in English to be able to meet graduation requirements. TOURS Group tours of the Manhattan Campus are scheduled from late September through May and last approximately 60 minutes. There are specific morning tours of the Junior School (pre-k to fourth grade), the Middle School (fourth to eighth grades), and the Tutorial House (High School, ninth to twelfth grades). Students applying for fifth to twelfth grades may join their parents for the tour. Please note that tours from September through March are reserved for families who have applied for admission for the following September. Tours of the Queens Campus are scheduled as needed. Please telephone (718) 658-6166 for an appointment. HOW TO APPLY To start the online application process, please see the "Online Application Process" section below. TRANSCRIPTS Please upload your family's copy of the previous two years of school reports (one year for applicants to pre-kindergarten to fourth grade) soon after submitting the application online. In November, submit the Academic Report Request form (which you can access here) to your child’s current nursery, primary, or secondary school (no sooner than that so that UNIS has the most recent report before it makes admissions decisions in late January). The current school should forward a report to UNIS on the student’s academic progress and behavior. Your school can upload school reports and send them to UNIS through Ravenna. Letters of recommendation from the school describing a student’s study habits and social maturity are required (for applicants to fourth to twelfth grades) unless the student’s school report includes comprehensive teacher comments. If those letters are necessary, they should come from an English teacher and a math teacher, and those teachers should email the letters directly to admissions@unis.org; no special form is required. If documents are not in English, an official English translation is to be submitted to UNIS along with the original documents. Prior to any admissions decision, complete and official records from the previous school(s) should reach UNIS by mid-January. In the case of a student coming from abroad, UNIS also needs to receive the results of any national exam taken. TESTING Students applying for the Manhattan Campus who are fluent in English are assessed by the Educational Records Bureau (ERB) by taking the ISEE test, an independent testing agency. Please go to https://erblearn.org/. to download an application and get information about that admissions test. Applicants to pre-kindergarten, kindergarten, and first grade are not required to take the ERB or any other type of standardized test, and UNIS will not consider the scores of those tests if they are submitted. Students applying to ninth to twelfth grade may substitute PSAT, SAT, or SSAT results, and they will be asked to write an essay at UNIS. Students applying for the Queens Campus will be tested directly at the school during the interview. However, if an applicant has been tested by the ERB, the parents should request that ERB send the results to UNIS. INTERVIEW Once you have submitted an application, please schedule a tour and interview through Ravenna (if you have already taken a tour, please contact the admissions office by email or phone to schedule an interview). Junior School applicants are interviewed in small groups. Applicants for Middle School and Tutorial House (high school) are interviewed individually. DECISIONS Admissions decisions for the next school year are announced from February onward. Parents are required to inform the School of their intentions within approximately two weeks of notification of acceptance. All other decisions are usually given within a few weeks of the completion of the admissions procedures. FINANCIAL AID is based solely on documented financial need. UNIS’ financial aid program exists to make its educational program accessible to highly qualified students, regardless of family income. In service of this commitment, UNIS offers need-based financial aid to newly admitted students who will enrich and be enriched by our educational community. For families receiving aid, the school is also committed to underwriting the costs of required or essential educational resources, services, and opportunities not covered by tuition and to providing funds and resources to support participation in school-sponsored enrichment opportunities. An application for Financial Aid will not prejudice an admissions decision. UNIS uses its own Financial Aid form. Prospective families should submit Financial Aid applications to the Admissions Office. Early submission of the Financial Aid application will help insure a response at the same time that an admissions decision is given. MEDICAL RECORDS The UNIS medical form needs to be completed, signed by a physician, and returned to UNIS prior to a child’s joining a class. Medical forms need to include dates of vaccination as well as a physical examination. Medical forms should be submitted only once a student is enrolled at UNIS. STUDENT VISAS Applicants who do not have USA citizenship or permanent resident status (green card) must enter the USA under the “prospective student” B2 visa classification so that they can be tested and interviewed for admission. An I-20 certificate of eligibility for non-immigrant (F-1) student status is issued only if the student has been interviewed and accepted and if the family has paid 70% of the tuition fees for the academic year. If the student remains in the U.S., the I-20 form is then presented to the U.S. Citizenship and Immigration Services to obtain a change of status to F-1 “foreign student” status. A student who departs from the U.S. before obtaining student status must present the I-20 form to an American Consul abroad. GUARDIANSHIP Students who do not live with their parents are required to live with a parent-designated legal guardian who is at least 25 years of age and who speaks the primary language of the student as well as English. Under no circumstances are students permitted to live alone while attending UNIS. Guardians are required to join the applicant at the time of the admissions interview at UNIS so they understand the conditions of guardianship, and parents and guardians must sign and get notarized a UNIS guardianship form. Thank you for your interest in UNIS. The deadline for submission of applications to the Manhattan campus for the 2019-2020 school year is 15 November 2018, though we will accept applications from UN families from abroad and other international families after that, and from local families if there is space in a particular grade. We accept applications for immediate entry for the 2018-19 school year from UN families from abroad and other international families, and the deadline for those applications is 15 March 2019; families applying for immediate entry should please contact the Admissions Department at admissions@unis.org. The Queens campus has rolling admissions for the 2019-20 school year, but the deadline for applications for immediate entry for the 2018-19 school year is 15 March 2019. To apply: Create a Ravenna profile in order to apply online, to schedule a tour, assessment, or interview, and to submit all supplemental materials by clicking here (Ravenna). What is UNIS’ relationship to the U.N.? What are UNIS' class sizes? How many students does UNIS enroll? What does the UNIS curriculum offer? How are students assessed at UNIS? Do you have an after-school program? Where do UNIS students go to college? Does UNIS only accept UN-affiliated families? How do the school and parents communicate? How can parents volunteer and become involved? Do you have a financial aid program? Is there a lunch program? Is there a transportation program? Is it true that UNIS has a transient student population? My children speak only English. Will they be at a disadvantage when they enter a language class? UNIS is bigger than my children's school. How will they adjust? Where is your faculty from? Since there is more than one section in each grade, how is the teacher chosen for any given child? What kind of student does UNIS admit? Can my child spend a day at UNIS? Applicants to PK (preschool) must be four years old by 31 December in the year they enter that grade. Applicants to JA (kindergarten) must be five years old by 31 December in the year they enter that grade. Older students normally move on to the next grade. Some UNIS applicants come from countries that begin the school year in months other than September, and those families should please contact the Admissions Department to discuss which grade their children should apply for. In addition, students applying to the tenth through twelfth grades (T2 to T4) should verify, prior to applying for admission, that they can meet graduation requirements by the end of twelfth grade. UNIS maintains a strong relationship with the UN through its governance. The Secretary-General of the United Nations appoints the 18 members of the UNIS Board of Trustees, which is made up of parents, UN officials and other members of the community. G-4 Visas for faculty and their families. One half of the teaching staff teach at UNIS because of this arrangement. This benefit enables UNIS students to gain historic and contemporary knowledge and an understanding of the world by interacting with teachers from around the world. Gifts from governments – cash in kind, books, teachers and cultural events. The School is a not-for-profit organization under U.S. law and is chartered by the New York Regents to provide an international education for U.N. affiliated families and other families that would benefit from such an education. In the Junior School (Pre-K to J4), classes range in size from 16 to 22 students, often with two full-time teachers. Students in M1 to T4 classes typically range in number from 4 to 24. UNIS caters to all children's learning styles by offering group, individual instruction, or class instruction. Our teachers know when a child needs to be challenged or when a child needs more attention. They encourage children to learn by helping others and to seek out help when needed. To enable the teacher to have ample time for individualized instruction, the Junior School has specialist teachers (Science, French, Spanish, ESL, Art, Music, Computer, PE, Library). Additionally, there is one Teaching Assistant at each grade level and all Teaching Assistants have college degrees and backgrounds in education. We have about 1570 students between two campuses: 150 in Queens (K to 8) and 1450 in Manhattan (Pre-K to 12). Our student body is the most diverse in the world, representing 125 countries and speaking 103 languages. This means that they have daily contact with students from every part of the globe. 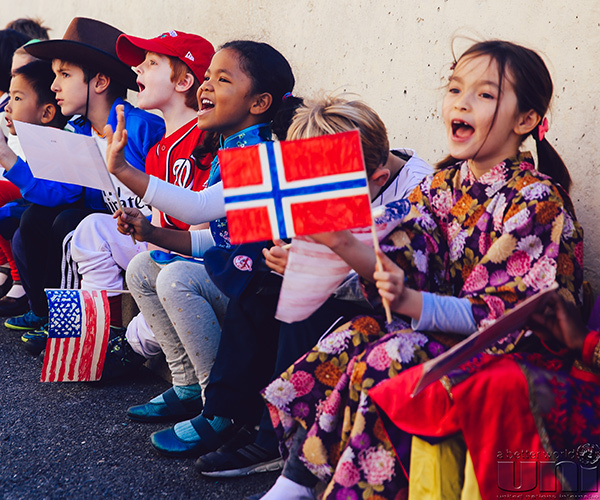 The international curriculum at UNIS from pre-kindergarten to Tutorial Four is designed to reflect the guiding principles of the UN Charter, which are enshrined in the constitution of the School. Students discover a welcoming atmosphere of friendliness, warmth, security, and a diverse and challenging environment. They have the opportunity to work and learn with peers from different countries, cultures and backgrounds. UNIS teachers, with their equally diverse origins, understand and respect these differences and respond to the needs of a vibrant international community of learners by designing a curriculum that meets the needs of individual students. From the very first year, the social, intellectual, aesthetic, emotional and physical needs of the student are central to the curriculum, so that the classroom becomes a world in which the acquisition of skills goes hand in hand with freedom to create and explore. The integrated learning that characterizes school life in the early grades is developed and diversified in the intermediate years, whereby a rigorous, but flexible and broad-based basis for learning is maintained, to embrace the acquisition of knowledge, the development of skills and attitudes and their complex application across the disciplines. As students move to the high school, the focus in the curriculum shifts from a more interdisciplinary focus to academic specialization, in recognition of the subject-based knowledge and understandings that are required for the UNIS Diploma, the International Baccalaureate (IB) Diploma and Certificates and college admissions. Students study across a broad and balanced range of subject domains including languages, humanities, sciences, mathematics, technology, the arts, and physical education, drawing on content from educational cultures across the world. Tutorial House students are provided with intellectually challenging learning experiences, enabling them to examine the central ideas of an issue, question and share ideas and knowledge and use higher-order critical thinking skills to solve and construct new meanings and understandings. When students graduate from UNIS, they leave not only with a solid academic foundation but they also take with them a genuine understanding of global interdependence and a respect for differences, both cultural and academic. Their education has equipped them with a sense of academic responsibility and independence and encouraged them to be responsible, informed and caring members of society. Please see the Curriculum Page for more information. The goal of assessment at the UNIS is to support both learning and teaching through varied and balanced Pre-Kindergarten to Tutorial Four assessment practices, which are aligned with the curriculum, reflect the international nature of the school, and include useful feedback to students, parents, teachers and administrators. Student-focused, authentic and age-appropriate assessment at UNIS represents a celebration of achievement, which ensures ongoing student involvement and lasting understanding. Common subject assessment is administered in all grades through Tutorial Two while the International Baccalaureate examinations are administered in Tutorial Three and Four. Grading criteria are clear and consistent within and across subjects and are shared with students. Information on student performance is clearly communicated through interim reports, progress reports, parent teacher conferences and other communication as needed. External standardized tests at specific grade levels are also offered to meet the specific needs of students. Included is optional standardized testing in the Middle School and required PSAT and recommended SAT and/or ACT testing in the Tutorial House. The UNIS curriculum in Tutorial Three and Four follows the pattern of the International Baccalaureate (IB) Diploma, and most courses are IB courses. Both broad and deep, our curriculum requires six subjects from at least five different academic areas, all studied over a two-year period. Most subjects are available at both Higher and Standard IB levels, and IB Diploma candidates must take three of their subjects at Higher Level. Required areas of study are Mathematics; two languages (one a literature course, the other either a learned-language course or a second literature course); a natural science course; a humanities/social science course; and either an arts course or a further languages/science /humanities course. In fulfillment of this basic structure, we offer many languages in addition to English, French and Spanish. In addition we provide classes in Biology, Chemistry and Physics, a wide range of humanities choices–IB Anthropology, Economics, History, Philosophy and Psychology-as well as courses in Contemporary Issues and Information Technology in a Global Society, and Visual Arts, Music, and Theatre Arts, as well as Computer Science. All students must complete a major individual project ("extended essay"), participate in an extra-curricular program with Creative, Active and Service components; and, for IB Diploma students, take a Theory of Knowledge course which asks students to examine how they know what they know. The end result, we expect, is a broadly educated and thoughtful person, well prepared for the challenges of university study and for life in a complex 21st-century world. Please see the International Baccalaureate page for more information. Yes, we have two types of programs. One is a Care Program for Junior School and Middle School children, which goes from 3:00 to 6:00 pm. The Care Program is designed to meet the needs of Junior and Middle School parents who want their children to do their homework and be engaged in relaxing and creative activities after school hours. The other program, the After School Program for Junior One to Tutorial Four students, is built around specific interests, ranging from sports to art. Students may sign up for one or more of these activities which usually last for about an hour after school. Please see the Camps, Care, and After-School Page for more information. Helping students prepare for college is ongoing throughout the high school years. In Tutorial One, parents and students participate in Looking Ahead to College, a program that introduces them to the various facets of the college selection process and provides suggestions as to how younger students can develop their personal and academic strengths to enhance their admissibility to colleges. The college counselors work closely with administration, IB coordinators and guidance counselors in assisting Tutorial students and parents in IB course selection as it relates to university entrance. The formal college counseling program begins at the midpoint of Tutorial Three and continues until the end of Tutorial four with an extensive array of group programs, as well as individual counseling, for students and parents. For further details please refer to Tutorial House College Counseling Page. In the universal arena of competitive college admissions UNIS students are winners. Each year students apply to over 200 universities in North America, Europe and Asia with great success. From the University of Bristol (UK) to Brown, Harvard to Hofstra, the University of Maastrict in The Netherlands to McGill in Canada, UNIS students, armed with the power of their UNIS/IB education, find the doors to the world’s most respected universities open to them. The International Baccalaureate program is an internationally renowned credential that is regarded as the gold standard in terms of secondary school preparation for college. In many countries, the IB diploma program is the equivalent of the national exam that enables students to complete a university degree in three years. Many colleges in the U.S. grant up to a year’s advanced standing for IB students. The primary purpose of UNIS is to provide an international education for families affiliated with the United Nations as well as for other families seeking a similar education for their children. UN-affiliated families represent about 55% of the student body with the 45% coming from other families living in the New York City area. The school encourages close home-school partnerships in order to ensure that communication is positive and open. There are two formal parent/teacher conferences each year, and parents are also encouraged to contact their children’s teachers if the need for other conferences arises. Report cards are issued twice a year to all students. Teachers also communicate on an as-need basis with parents. The Parent Association meets on a monthly basis, and these meetings are open to all UNIS parents. Each school division also hosts coffee mornings that focus on speakers and topics of interest to each particular school division. Curriculum nights are scheduled at the beginning of the school year and teachers present the year’s curriculum and topics of studies to parents. Many other school events are open to parents during the year, such as special cultural events, assemblies, college counseling events, workshops, to name a few. Weekly emails are sent out from division principals and archived on the division resource pages. The newsletters included general school news and newsletters from each of the school divisions that provide information about particular activities and events happening in that division. In the Junior School, the Parent Association organizes two class parents per homeroom each year whose role is to support the classroom teachers in homeroom activities, such as field trips and special class activities. In the homerooms, parents will often come and share with students presentations about their home country or information about their job. Parents are welcome to attend special presentations by students either in the homeroom or in specialist classes during the year. There are also Junior School Coffee mornings, where speakers present information on a topic of interest to Junior School parents. Middle School and Tutorial House parents can volunteer to be Tutorial House coordinators or grade representatives. Parents can volunteer to organize or help with the International Lunch for students as part of the UN Day celebrations. Parents also organize “Let’s Lunch” programs for each of the grades Tutorial One, Tutorial Two and Tutorial Three, when parents and alumni professionals to come to UNIS and talk to students about different career opportunities. There are regular morning meetings organized for Tutorial House parents where topics of general interest are discussed and any general question can be raised by parents. At the Queens Campus, parents are encouraged to be active members of the Parents Association. The PA organizes a number of events throughout the year such as bake sales, book fairs, multi-cultural assemblies, charitable fund raisers, and international lunches. Parents support learning by working in the classrooms with teachers, particularly by sharing their cultural festivals and customs, and by helping to chaperone field trips. Coffee mornings are held monthly throughout the year for parents to discuss topics of interest presented by visiting specialists from around the School. The 2016 -2017 tuition and fee schedule requires payment of 70 percent of tuition by 3 August 2016 and 30 percent by 4 January 2017. Alternatively, the school offers a monthly payment plan administered by "Tuition Management Systems"and a Loan through “Your Tuition Solution." The UNIS Monthly Payment Plan - allows you to pay annual expenses in 10 interest-free installments beginning May 1, 2016. The Loan - offers the benefits of a generous repayment term, low fixed rates, no prepayment penalty, no down payment or application fees. If you have any questions or need assistance in determining which option best fits your family’s needs, call Tuition Management Systems at (888) 805-9817, and one of their education payment partners will be happy to assist you. You may also visit the website at www.afford.com/unis for easy online applications and helpful information and articles. For information about the loan program, please visit www.yourtuitionsolution.com or call (800) 920-9777. A family with a demonstrated need may be eligible for a financial aid award to assist them in meeting a portion of their tuition fees for their child(ren) enrolled in UNIS. For further information, please contact Delia Arellano-Doyle, Controller, at (212) 584-3043. Some students have the school meal plan, and others buy food a la carte or bring their own lunches. The Manhattan dining program is administered by the FLIK Independent Schools. Please contact Corey Dorn at (212) 584-3069 or by email at cdorn@unis.org for further information. The Queens dining program is administered by Butterbeans. Please see the Food at UNIS Page for more information. The school participates in a transportation program administered by the New York City Board of Education Office of Pupil Transportation. If you reside in Manhattan and your child is enrolled at the Manhattan campus in Junior A through Middle Two, he or she may be eligible for yellow school bus transportation. Please refer to www.opt-osfns.org/opt/ for eligibility requirements. Students enrolled in grades Middle Three through Tutorial Four are eligible for either half-fare or full-fare metro cards based on distance and grade. Please refer to www.opt-osfns.org/opt/ for eligibility requirements for yellow bus service and metro cards. For any further information regarding enrollment, schedules, and metro cards, please contact Hiba Ikli, Transportation Coordinator at hikli@unis.org or call (212) 584-3154. For the Queens Campus, parents should check transportation arrangements with the Queens’ Administrative Assistant. No. The average annual attrition rate at UNIS over the past five years is 10%, and over 60% of the graduating class has been here for six or more years. Furthermore, over a third of the graduating class has been at UNIS since Kindergarten. We have beginning French and Spanish classes at most grade levels, and we teach those classes as well on more advanced levels. Students usually begin French or Spanish in pre-kindergarten, and Mandarin is available after school, starting in kindergarten. Students add another language in seventh grade, and UNIS teaches eight languages besides English during the school day: in addition to French, Spanish, and Mandarin, we teach Russian, Japanese, Arabic, German, and Italian. For a number of other languages, Mother Tongue classes are held after school. Before each school year begins, we have an orientation for all new students and parents, and so they begin the school year already knowing all the other new students as well as many of the continuing students and the teachers and administrators. In addition, each student has an advisor and a guidance counselor, and meetings with them are scheduled for throughout the year. As a global school with unrivaled diversity, UNIS has students and teachers who have moved, in many cases, from far away, and so the school is supportive of new students, in practical ways that have been successful for many years. Our faculty and staff represent over 85 countries. Approximately 80% of them have taught abroad and speak two or more languages. 40% of them have been at UNIS for ten or more years, which means that they are experienced enough to provide individualized attention to a child the moment he enters the classroom. The faculty is chosen not only for their subject mastery but also for their nurturing skills. In 1947, as a small nursery school in Queens, by UN parents who wanted to ensure that their children could maintain their cultural identities, as well as get an education that would enable them to return to any national educational system. Gradually more grades were added, and admission was opened to non-UN students who could follow the program of study. Enrollment grew quickly, and the first 12th grade class graduated in 1964. The Manhattan campus was designed by Harrison & Abramovitz (part of the architectural team that designed the UN) and it was finished in 1973 with the financial help of the Ford Foundation and the Rockefeller Brothers Fund. Over the summer the principals work with the current-student lists and new-student lists. They study each new student's folder carefully and read any comments that parents and teachers have made to ensure a good student-teacher match. They also plan classes with an even balance of boys and girls, of national background, and of personalities. For the Junior School, list preparation begins in early May. Teachers are actively involved in developing a full profile document on each student. This documents looks at all aspects of the whole child, both academic and socio-emotional. Teachers work as grade level teams to develop the groupings for the following year ensuring a balance of gender, nationality, friendship groupings and academic balance. After homeroom teachers are finished with this process, the specialist teachers, student support teachers and administrators review the lists to confirm the appropriateness of each placement. The school is selective and looks for students who can follow the program of study, are socially mature, intellectually curious and whose parents are supportive of the School's mission. Admitted students from fifth grade onward may attend classes for one day. The Manhattan campus was designed and built specifically for UNIS, and it overlooks the East River at East 25th Street. The building is modern and spacious, housing well-designed classrooms, gymnasiums, two excellent libraries, a state-of-the art media center, sound-proof music rooms, bright art studios, language, science, computer and media labs, two student lounges, outdoor play facilities, a cafeteria, Nurse's Office, and a theater. The Queens campus is located in residential Jamaica Estates, approximately 13 miles east of the Manhattan campus. In addition to the two-story building on Croydon Road, there is an outdoor play area, sports field, and an environmental center. The school building houses a library/media center, science lab, IT/maker space, music classroom, art studio, gymnasium/auditorium/modern language rooms, ELL rooms, learning support area, nurses station, and subject classrooms. For the Manhattan campus, there will be an Open House for parents interested in learning about the kindergarten program, and it will be held on Wednesday, 15 May from 4:30 to 6:30 p.m. Parents interested in attending should make a reservation by clicking on the button below. Tours of UNIS are held throughout the spring, and there are separate tours for all three divisions of the school. Parents interested in joining a tour should make a reservation by clicking on the button below. Students are welcome to join their parents on tours of the Middle School and Tutorial House (high school), but the Junior School tours are for parents only. If parents living outside New York don't find a tour on the days they will be visiting the city, they should be contact the Admissions Department (admissions@unis.org) to schedule their tour. Parents who are interested in applying for Kindergarten through eighth grade are invited to visit the Queens campus, learn more about the curriculum, and take a tour. For information or to sign up, please contact Rebecca Sorrentini by sending an email to rsorrentini@unis.org or calling (718) 658-6166. Note: If a Queens student transfers to Manhattan campus before 9th grade (T1), an additional $ 2,000 is charged. Parents who initially enroll and then withdraw their child by 1 April 2019 are refunded the one-time New Parent Levy and the Security Deposit. After 1 April 2019, only the Security Deposit is refunded. Parents who enroll their children after 2 January 2019 are expected to pay their pro-rata tuition for the remainder of the academic year prior to the children starting school. Although we do not consider financial aid applications before admissions decisions have been made, the process of notifying you about the financial aid will be more efficient if you submit your on-line financial aid application in advance. To begin the process, please follow the instructions below and return the required information to the UNIS Admissions Office as soon as possible. With your 2017 tax return and W2, we will be able to provide an estimated financial aid decision (if and when we send you an offer of admission). However, if you are able to submit a 2018 tax return to us by 10 January 2019, we can give you a final financial aid decision before your enrollment contract is due to be returned to us. The SSS financial aid application for the 2019-2020 academic year can be found through a link available on your Ravenna account. Directions for completion of the online application are included in the website. The UNIS school code to be included on the Parent’s Financial Statement (PFS) form is SSS code 4581. You must include the school code in order for the PFS form to be processed. The application fee for online application is $48.00. SSS starts processing financial aid information starting on 1 November 2018, and we recommend that you submit your information to SSS by 31 December 2018 in order for UNIS to receive information from SSS in time for the February admissions notifications. Form 4506-T is available here. (A) United States Citizens who are not employed by the United Nations: Submit a copy of your 2017 Federal Tax Return, 2017 State Tax Return, W-2 forms and a copy of the Parents’ Financial Statement (PFS) to UNIS at the address listed below. (B) United Nations Employees: Submit a copy of your December 2017 salary stub, a copy of your 2017 Federal Tax Return, 2017 State Tax Return if there is income reported to the U.S. Internal Revenue Service, and a copy of the Parents’ Financial Statement (PFS) to UNIS at the address listed below. (C) Mission and Consulate Employees: Submit a statement signed by the appropriate authority at the Mission or Consulate indicating annual salary and the amount of housing and/or education allowance to which you are entitled. You must also submit a copy of your 2017 Federal Tax Return and 2017 State Tax Return if there is income reported to the U.S. Internal Revenue Service, as well as a copy of the Parents’ Financial Statement (PFS) to UNIS at the address listed below. (D) All others, including step-parents, please follow procedures stated in letter (A). (E) For all parents filing a U.S. federal income tax return: After you have filed your 2018 tax return with the IRS, please complete this Form 4506-T(box 1a,1b,2a,3 and 4), and then sign and mail it to the appropriate IRS Center (address attached with the Form 4506-T). Please ensure that you list the United Nations International School as the recipient of the results from the form. Please submit all requested documents to Admissions@unis.org. Regarding students who apply to UNIS after February 2019: In order to be notified of the final financial aid decision by June 2019, the PFS and 2018 tax returns must be received by the school as soon as possible, but no later than 16 April 2019. Applications submitted after 16 April will not be reviewed until September 2019, and aid will be offered only if funds are available. The Financial Aid Committee evaluates an applicant’s need in light of UNIS’ financial aid resources. Awards will only be granted to those applicants who demonstrate an ability to meet their financial obligations to the School. Financial aid is contingent upon continued cooperation from parents and the student’s satisfactory performance. The Financial Aid fund is for parents who do not receive an education grant from the United Nations, their government, employer, or other sources. Therefore, UN or Mission parents who are eligible for reimbursement of tuition from the UN or their Mission are not eligible for financial aid and should not apply. We thank you for the prompt submission of your financial documentation. If you have any questions, please call Delia Arellano-Doyle at (212) 584-3043 or email her at darellanodoyle@unis.org.